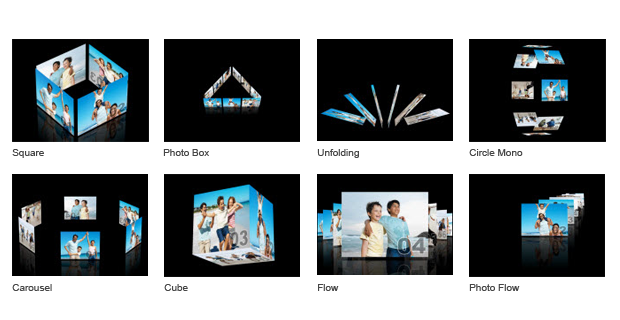 Exclusive 3D Style Expansion Pack for Wondershare DVD Slideshow Builder to make amazing DVD slideshow. I’ve got a little website business going and, when you’re like me and can’t afford to hire expensive designers or purchase megabucks worth of high-end design software—you need a solution that’s simple, elegant and affordable. For me that was DVD Slideshow Builder and this stunning 3D pack. My small business has a loyal following, but we needed something in the showroom to really dazzle people who’d just walked in off the street. This dynamic pack for my DVD Slideshow Builder was the very thing I needed. Now, when folks walk in, they see an animated montage of the great results my company provides. Wondershare 3D Style Pack maximizes your photo slideshow experience with our product DVD Slideshow Builder Deluxe and Standard. With it, you get new way to surprise everyone for your video talent, including yourself. It includes more than 10 "Styles" of popular 3D video effects, like 3D Cube, Photo Flow, 3D Wall, 3D Square, 3D Carousel, 3D Box, and so on. Want to try 3D movie styles? Now download DVD Slideshow Builder Deluxe version or Standard version for free trial. But once again, you need to purchase both the software and style pack to create 3D slideshow with 3D movie effects. Do note that 3D styles can only be used in Standard mode at the moment.